After the P22 sale tickets on the last 2 days, we have another affordable flight you can avail for April, May, June, July 2018 trips! For as low as P1,299 Cebu Pacific promo fare travel from Manila to Tuguegarao. Other low fares from Manila available to Visayas, Luzon and Mindanao ranges from P1,499 to P2,999. Going to international destinations? Travel to Kota Kinabalu costs only P1,699. Flights to Hong Kong, Guangzhou, Macau are as low as P2,099. Book Cebu Pacific sale tickets from today until March 13, 2018 for Philippine routes and until March 16, 2018 for international trips. The Cebu Pacific affordable fares are good for travel from April 1 until July 31, 2018. Promo tickets are limited and may not be available on all flights! Book fast to get the lowest fares! Cebu Pacific promo fares are valid for one-way trip covering the fare, Web Admin Fee, taxes & fees and free 7 kilos hand carry baggage. For checked baggage, better, purchase a Prepaid Baggage Allowance to save on baggage fees. You may buy prepaid baggage allowance during booking or up to 4 hours prior to flight departure. You may say, the Cebu Pacific tickets are not that low. However, consider that the low fares can be used in near travel dates. If ever, you do not need to travel in a fixed date, it is advisable to search for low fares on other days. 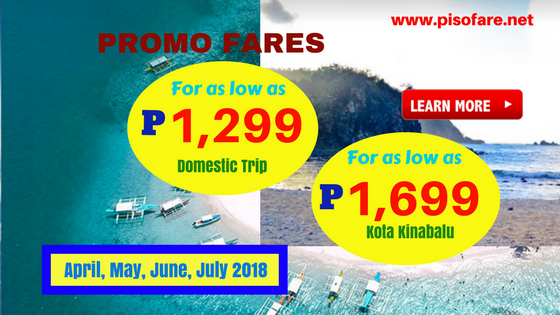 To avail the new Cebu Pacific promo fare, you may either a) book online at www.cebupacificair.com, b) buy tickets at Cebu Pacific sales and ticket offices, c) call the airline hotlines in Manila at (02) 702 0888 or in Cebu at tel. # (032) 230 8888, or d) proceed to your favorite travel agent/ ticket booking office and buy the low fares from them. Check the destinations on promo and book or buy tickets the soonest possible time. Sale tickets are limited and on a First Come, First Serve basis! Want to receive promo fare updates of Cebu Pacific Air, Philippine Airlines, Air Asia and other airlines? Simply LIKE our Facebook: PISO FARE TICKET to get seat notification in your newsfeed!